Units of the Resolair 62 and 66 series achieve a very high heat recovery efficiency up to 90% and at the same time a moisture recovery up to 70% thanks to the regenerative heat recovery system. The result is a comfortable climate at lowest energy costs. The integrated compression refrigeration system of Series 66 increases the cooling capacity of the entire system at high temperatures. 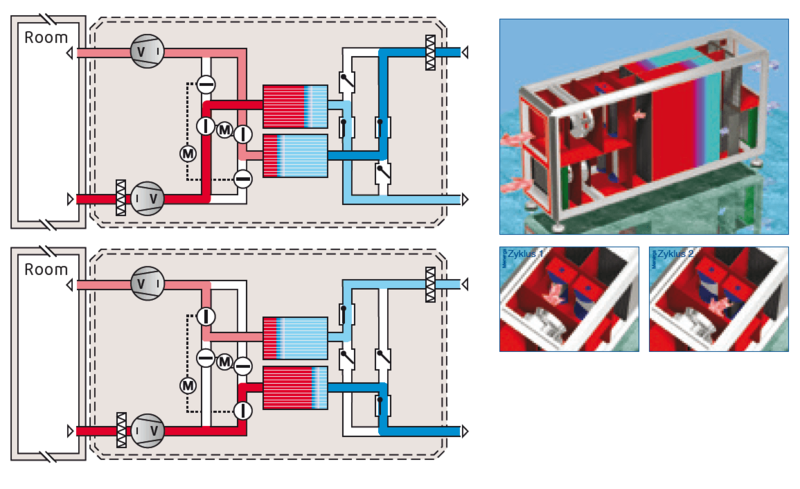 The unit contains two heat storgae packets with highly sensitive accumulator mass, through which the outside and return air are transported alternately. The accumulator mass is able to capture heat from a warm air flow very rapidly and transferring this just as rapidly to the cold air flow. There is a damper system installed upstream and downstream of the packets. The damper system at RA/SA side is actuated by electric motors, while the damper system at OA/EA side operates dynamically. The fans in the return air and supply air sections simultaneously supply cold outside air through one packet and warm return air through the other. One packet stores the heat from the return air, which the other packet simultaneously discharges stored heat into the outside air. The temperature efficiency of the regenerative energy exchanger is over 90%. Thus the unit obtains virtually all the heat energy back from the return air. This means that an additional supply air heating coil is not needed and the internal heat load covers the transmission heat loss. Despite the very high heat recovery efficiency of the Resolair series, the regenerative heat recovery system used requires no defrost mode. The heating capacity normally needed is not required in this case. In wintertime conditions, the humidity recovery of the regenerative heat recovery system is up to 70%, which in most applications makes an additional humidification system obsolete in winter. Where outside air temperatures are rising, variable alteration of the switching cycles allows heat recovery to be reduced all the way down to free cooling. 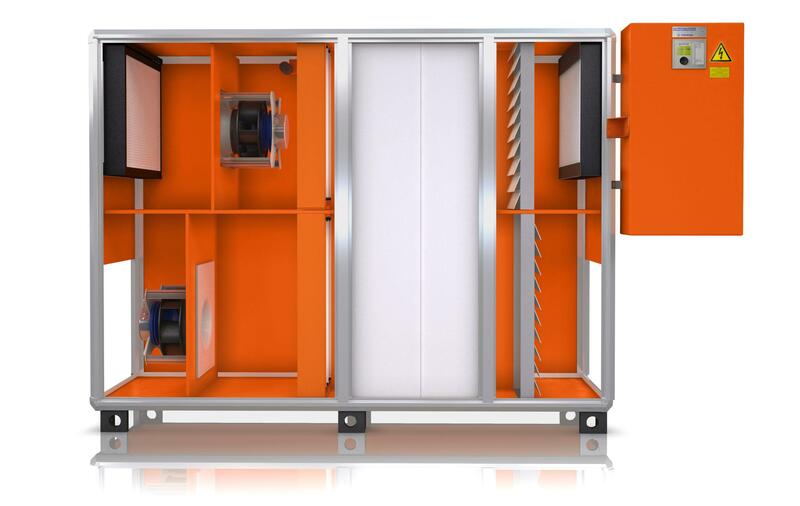 If the outside temperatures exceed the indoor temperature, the unit switches back into the basic cycle and then operates in “cooling recovery mode” with the same high degree of efficiency as for heat recovery. For the removal of higher internal heat loads at high outside air temperatures the integrated compressior refrigeration system is switched on (66 series).